A view of downtown San Jose, the self-proclaimed "Capital of Silicon Valley." 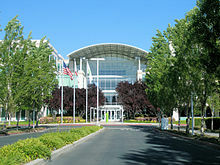 Silicon Valley is the southern part of the San Francisco Bay Area in California in the United States. The term originally meant the innovators and manufacturers of silicon chip who worked here, but now means all the high tech businesses in the area. Even though it's not truly a valley, it is a term for the high-tech sector generally. 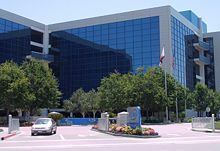 Silicon Valley includes the northern part of Santa Clara Valley and adjacent communities in the southern parts of the San Francisco Peninsula and East Bay. It reaches from Menlo Park (on the Peninsula) and the Fremont/Newark area in the East Bay down to San Jose. The term Silicon Valley was coined by journalist Don Hoefler in 1971. He used it as the title of a series of articles "Silicon Valley USA" in a weekly trade newspaper Electronic News which started with the January 11, 1971 issue. 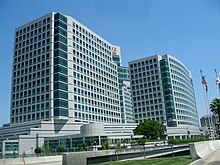 Valley refers to the Santa Clara Valley, located at the southern end of San Francisco Bay, while Silicon refers to the high concentration of semiconductor and computer-related industries in the area. These and similar technology firms slowly replaced the orchards which gave the area its initial nickname, the Valley of Heart's Delight. The San Francisco Bay Area had long been a major site of U.S. Navy work, as well as the site of the Navy's large research airfield at Moffett Field. A number of technology firms had set up shop in the area around Moffett to serve the Navy. When the Navy moved most of its West Coast operations to San Diego, NASA took over portions of Moffett for aeronautics research. Many of the original companies stayed, while new ones moved in. The immediate area was soon filled with aerospace firms. However, there was almost no civilian "high-tech" industry in the area. Although there were a number of excellent schools in the area, graduating students almost always moved east or south (that is, to Los Angeles County) to find work. This was particularly annoying to Frederick Terman, a professor at Stanford University. He decided that a vast area of unused Stanford land was perfect for real estate development, and set up a program to encourage students to stay in the area by enabling them to easily find venture capital. One of the major success stories of the program was that it convinced two students to stay in the area, William Hewlett and David Packard. In 1939, they founded Hewlett-Packard in Packard's garage, which would go on to be one of the first "high tech" firms in the area that was not directly related to NASA or the U.S. Navy. 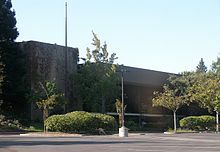 Befitting its heritage, Silicon Valley is home to the high-tech superstore chain Fry's Electronics. In the James Bond film A View to a Kill, villain Max Zorin plans to destroy Silicon Valley by detonating explosives between the Hayward Fault and San Andreas Fault, causing them to flood. He dubs the operation 'Main Strike' in order to gain complete control of the microchip market by selling his own and destroying the competition. ↑ Although Redwood City is not part of the region traditionally recognized as Silicon Valley, many now consider it to be part of the region, because of its proximity to Menlo Park and its high density of technology companies. ↑ Although Santa Cruz County is not always considered part of Silicon Valley, several smaller high-tech companies have located in the Scotts Valley and Santa Cruz area. This page was last changed on 5 February 2019, at 15:57.